Fiber reinforced and frost proof polymer mortar. It does not shrink and has exceptional workability, adhesion, as well as flexibility. 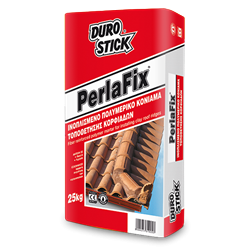 Suitable for unbreakable clay ridge and roof finial installations as well as for the sealing of the eaves around the perimeter edges of the clay tiles. It ensures unbreakable adhesion and it is offered as an optimal solution to roof problems created by adverse weather conditions.